Boynton Beach Therapist: Beachway Therapy Center - Therapist 33426. Send A Message To Beachway Therapy Center. Dr. Barnell Phillips (Board-Certified with an M.D. in Neuropsychiatry) is committed to the practice of evidence-based psychiatric treatment. His professional motto has guided his practice well: “In psychiatry, quality matters most.” The clients at Beachway benefit from his long and successful medical career which began at the Boonshoft School of Medicine at Wright State University in Dayton, Ohio. In 2005, he finished his internship and residency in psychiatry at the University of Maryland Medical System and Sheppard Pratt Hospital System in Baltimore. Two years later, he finished an adolescent and child fellowship at the same hospital. Other professional achievements include serving as a psychiatrist for the US Air Force, consulting for a collegiate mental health facility, and consulting for other hospitals. Dr. Phillips’ experience allows him to effectively assess and treat patients from all backgrounds here at Beachway. As a Licensed Clinical Social Worker (LCSW), Jennifer is an outstanding Clinical Director at Beachway. Her extensive background is in addictions, body image, co-occurring disorders, eating disorders, trauma, and mental health. Jennifer earned a BA in Sociology from Coastal Carolina University, and from Florida Atlantic University she earned a Masters in Social Work in clinical social work. Her previous experience includes providing group, family, and individual therapy to treat chemical addictions, substance abuse, and mood and personality disorders. Jennifer uniquely understands the challenges addicts in the early phases of recovery face. She has successfully implemented recovery programs for her patients and understands the importance of helping the families of addicts. Carrie is the lead therapist at Beachway and holds a BA in social work from Florida Atlantic University, a MA from Barry University (Miami), and is a Licensed Clinical Social Worker. She also has a background in medical social work. Her understanding of cognitive behavioral therapy, solution focused therapy, and family systems guides her treatment of addicts and families. Her clients thrive under her guidance because of her honesty, empathy, and compassion. Recognizing the severe impact of addictions on both the addict and the families, Carrie is dedicated to consistently serve her clients. Elizabeth’s educational qualifications include a Master’s Degree in Social Work from Florida Atlantic University, a license in clinical social work (LCSW), and a Florida Qualified Supervisor. She successfully operated a private practice in Delray Beach (PBC Therapy) and served as a psychotherapist for a community mental health agency. 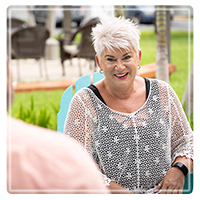 Her 30 years of experience in 12 step programs, alcohol abuse and addiction treatment, codependency counseling, crisis and trauma intervention, and life transitions help the clients of Beachway find wellness and healing in their journeys. She specializes in a wide range of therapies including art, breath, experiential, behavioral, and equine therapies. For over three years, Brian has been a valued member of the Beachway staff, fulfilling several positions. Beginning as a behavioral health technician, he was quickly promoted to the position of supervisor over behavioral health because of his dedication and understanding of substance abuse. Following this, he gained the promotion of therapist, in which he continues to expand his education in social work and understanding of addictions. dynamics makes him a invaluable member of the Beachway therapy team. Brian holds an MA from Palm Beach Atlantic University and is a Mental Health Counselor for Beachway. Brian brings extensive experience in cognitive behavioral therapy and treating mental health problems to his clients. Deeply compassionate to the needs of an addict, Brian guides his clients through a process of action, self-awareness, and accountability through the twelve-step program to a point of life-long sobriety. Brian also understands the impact of addictions on the addict’s family and works with the entire family to achieve sobriety and prevent relapse. Aimee’s passion is to offer hope from addiction and a clear path to sobriety and wholeness for addicts and their families. She earned a MA in Social Work from Florida Atlantic University and is a clinical social worker specializing in addictions. Her understanding and experience with addictions, mental health issues, co-occurring disorders, and personality disorders is invaluable to her clients at Beachway. Some of the therapies she regularly integrates into her methodology include narrative therapy, behavior therapy, cognitive behavioral therapy, and twelve-step principles. She is a member of a number of organizations: the National Association of Social Workers, the Phi-Alpha National Social Work Honor Society, and the National Alliance on Mental Illness. Jerry earned an undergraduate degree at Eastern Connecticut State University and a graduate degree from Southern Connecticut State University. Jerry brings a unique athletic perspective to his Beachway clients. As well as playing collegiate baseball and coaching high school baseball, he also earned a national certification by NASN to be a personal trainer. Furthermore, Jerry privately coaches college and high school pitchers. In serving his clients at Beachway, he begins with the foundational philosophies of the twelve-step program to energize and propel them to a productive sober recovery. Michael’s dedication to the arts and to the clients at Beachway have resulted in a wonderful psychodrama program that enables addicts to unite to their “true self” through the creative process. Michel graduated from the American Academy of Dramatic Arts (New York City) and has four decades of experience in television, theater, and film. For nearly two decades, he taught improv and drama throughout Europe and the United States, where his visual art exhibitions have also appeared. His contribution to the art therapy programs at Beachway are invaluable! Matt fills several roles at Beachway. As a musician, he coordinates the music therapy program, implementing performance, team building, and songwriting. He serves as the intake coordinator and gives the bio-psycho-social assessment to each new client. Matt is working towards his CAC (Certified Addiction Counselor) license so he can continue to serve the clients of Beachway more effectively. As a recovering addict, Matt has a strong commitment to art and music therapy and the twelve-step program. Our CEO brings years of knowledge, understanding, and experience to meet the needs of our clients at Beachway Therapy Center. With a personal motto of “help the suffering addict and alcoholic,” Denis willingly goes to any length to assist addicts on their personal road to recovery. Denis has a special understanding of the aftercare treatment that our clients require to maintain sobriety. He is involved with a hands-on approach to our sober-living facilities in Delray Beach and Boynton Beach, so he can meet the needs of our clients even after they leave the initial treatment phase. Within our community, Denis has a high level of credibility because of his dedication to the care and support of the addict and alcoholic. Our COO brings over ten years of invaluable experience founding and running new businesses to the Beachway team. Pamela’s business expertise has been instrumental in building Beachway Therapy Center to the outstanding facility that it is today. She passionately and tireless works to create a homey living experience to aid in the recovery of Beachway’s clientele. Pamela earned a Bachelor of Science degree from Lynn University (Boca Raton, FL) and puts that education to work for Beachway. On her own recovery journey from addiction, Pamela is dedicated to the mission of Beachway Therapy Center. Our CFO, Olivia Holmes, received a BA in Psychology from Florida Atlantic University. She has many years of leadership experience managing employees. The staff and clients at Beachway thrive in the stress-free work and living environments Olivia creates at Beachway. Lisa has been working for Beachway as a Behavioral Health Technician and Admissions Coordinator since 2013. As a former addict in recovery, Lisa continues an education in social work and psychology. Deborah received her BA from Central Pennsylvania College, and serves as our Associate Director of Admissions. A Beachway alumni, Deborah continues living in recovery as she works towards her CAC (Certified Addiction Counselor) license. Mark Henderson is originally from the Metropolitan Detroit Area. He holds a Bachelor of Science in Interdisciplinary Studies from the University of Central Florida. He is also an alumni of Beachway Therapy Center with a strong belief in and experience with the 12-Step model of recovery. He has a passion for helping those who are new to recovery integrate themselves into a new life in South Florida. Rima serves with dedication as the director of our Grapevine Sober Living facility. She has served the clients of Beachway and Grapevine tireless for 4 years, with her commitment to help each client in the road to recovery through the twelve step program, believing that with care and support, anyone who wants to can conquer their addiction. She also works with family members of addicts. Many have appreciated and recognized Rima’s dedication as part of their successful rehabilitation. Don't wait another day, because we can help.